Foerster, G. "Architectural Models of the Greco Roman Period and the Origin of the 'Galilean' Synagogue" in Ancient Synagogues Revealed. ed. L.I. Levine, Jerusalem, 1981: 45-48. 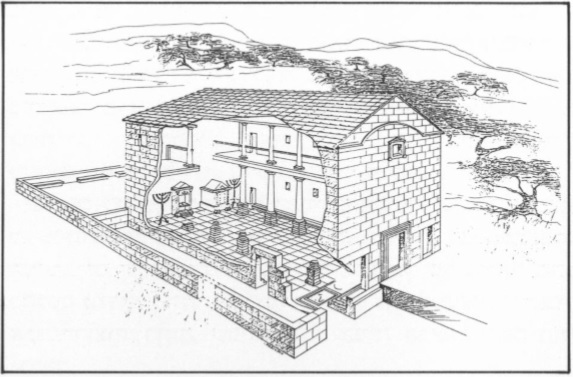 Foerster, G. "The Art and Architecture of the Synagogue in its Late Roman Setting" in The Synagogue in Late Antiquity. ed. L. I. Levine, New York, 1987: 139-146. Foerster, G. "The Ancient Synagogues of the Galilee" in The Galilee in Late Antiquity. ed. L.I. Levine, New York, 1992: 289-319. 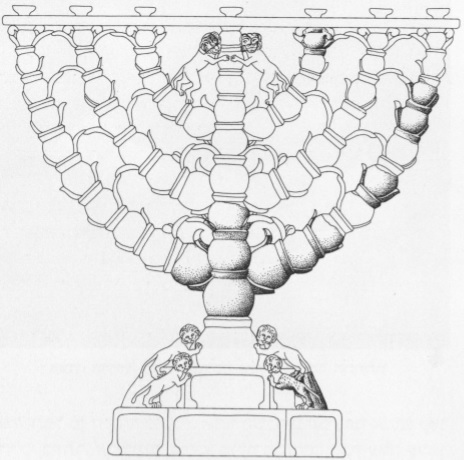 Foerster, G. "Dating Synagogues with a 'Basilical' Plan and an Apse" in Ancient Synagogues; Historical Analysis and Archaeological Discovery. ed. D. Urman and P.V.M. Flesher, Vol. 1, Leiden, 1995: 87-94. Foerster, G. "On the Mosaic of the Japhia Synagogue" Yediot 31, 1966: 218-224, (Hebrew). Foerster, G. "Notes on Recent Excavations in Capernaum (review article)" Israel Exploration Journal 21, 1971: 207-211. Foerster, G. Galilean Synagogues and their Relation to Hellenistic and Roman Art and Architecture. Unpublished PhD. Dissertation, Jerusalem, The Hebrew University, 1972, (Hebrew). Foerster, G. "The Synagogues at Masada and Herodium" Eretz Israel 1, 1973: 224-228. Foerster, G. "Some Menorah Reliefs from the Galilee" Israel Exploration Journal 24, 1974: 191-196. Foerster, G. "Notes on Recent Excavations at Capernaum" in Ancient Synagogues Revealed. ed. L.I. Levine, Jerusalem, 1981: 57-59. Foerster, G. "The Synagogues at Masada and Herodium" in Ancient Synagogues Revealed. ed. L.I. Levine, Jerusalem, 1981: 24-29. Foerster, G. "Hammath Gader Synagogue" Hadashot Archaeologiot 82, 1982: 11-12, (Hebrew). Foerster, G. "Representation of the Zodiac in Ancient Synagogues and their Iconographic sources" Eretz Israel 18, 1985: 380-391; 78*, (Hebrew; English summary). Foerster, G. "The Zodiac in Ancient Synagogues and Its Place in Jewish Thought and Literature" Eretz Israel 19, 1987: 225-234; 79*, (Hebrew; English summary). Foerster, G. "Jericho" The New Encyclopedia of Archeological Excavations in the Holy Land. 1993: 695-697. Foerster, G. "H. Shura" Hadashot Archeologiot 82, 1983: 7-9, (Hebrew). Foerster, G. "The Recent Excavations at Capernaum" Qadmoniot: A Journal for the Antiquities of Eretz-Israel and Bible Lands 4, 1971: 126-131, (Hebrew). Foerster, G. "Ancient Synagogues in Eretz-Israel" Qadmoniot: A Journal for the Antiquities of Eretz-Israel and Bible Lands 5, 1972: 38-42, (Hebrew). Freund, R.A. "The incense shovel of Bethsaida and synagogue iconography in late antiquity" in Bethsaida. 2, 1999: 413-459. Frey, J.B. Corpus Inscriptionum Judaicarum I. Roma, 1936. Frey, J.B. Corpus Inscriptionum Judaicarum II. Asie; Afrique. Roma, Pontificio Instituto di Archeologia Cristiana, 1952. Friedheim, E. "Sol Invictus in the Severus synagogue at Hammath Tiberias; the rabbis; and Jewish society : a different approach" Review of Rabbinic Judaism. 12;1, Leiden, 2009: 89-128. Friedman, M. "The meaning of the zodiac in synagogues in the Land of Israel during the Byzantine period." Ars Judaica 1, Ramat- Gan, 2005: 51-62. Gal, T. "Ancient Synagogues in the Eastern Part of Lower Galilee" in Zev Vilnay's Jubilee Volume. ed. E. Schiller, Jerusalem, 1984: 263-266, (Hebrew). Gal, Z. "Ancient Synagogues in the Eastern Lower Galilee" in Ancient Synagogues; Historical Analysis and Archaeological Discovery. ed. D. Urman and P.V.M. Flesher, Vol. 1, Leiden, 1995: 166-173. Gardner, G.E. and Werlin, S.H. Ancient Synagogues of Southern Palestine, 300–800 CE: Living on the Edge. The Brill Reference Library of Judaism vol. 47, Brill, 2015. Gekht, Y. "A Synagogue in Central Tiberias" Eretz Israel 31, 2015: 76-82, (Hebrew). Gershet, R. "The Decorated Lintel from the Synagogue at Raqit" in Raqit; Marinus Estate on the Carmel; Israel. ed. S. Dar, Bar International Series 1300, 2004: 178-189. Gittleman, E. Judging Samson: The synagogue floor mosaics of Horvat Huqoq and Wadi Hamam. MA Thesis, Southern Methodist University, 2015. Goldman, B. "The Sacred Portal" in . Detroit, 1966. Goldschmidt, S. "Synagogue Remains at the Mound of Kefar Qarnaim" Eretz Israel 11, 1973: 39-40, (Hebrew). Goodenough, E.R. Jewish Symbols in the Greco-Roman Period 1-13. New York, 1953-1968. Govrin, Y. "A New Proposal for the Architectural Design of Ancient Synagoguesin the Southern Hebron Hills" in Judea and Samaria Research Studies. 3, Ariel, 1993: 197-211, (Hebrew). Grabbe, L.L. "Synagogues in Pre-70 Palestine: A Re-assessment" Journal of Theological Studies 39, 1988: 401-410. Grabbe, L.L. "Synagogues in Pre-70 Palestine: A Re-Assessment';" in Ancient Synagogues; Historical Analysis and Archaeological Discovery. ed. D. Urman and P.V.M. Flesher, Vol. 1, Leiden, 1995: 17-26. Graicer, N. "Time of Establishment of the Synagogue of Baram - A Constructionist View" Jerusalem and Eretz- Israel 8-9, 2013: 395-419, (Hebrew). Grey, M. "The redeemer to arise from the house of Dan : Samson; Apocalypticism; and Messianic hopes in Late Antique Galilee" in Journal for the Study of Judaism in the Persian; Hellenistic and Roman Period. 44; 4-5, 2013: 553-589. Griffiths, J.G. "Egypt and the Rise of the Synagogue" Journal of Theological Studies 38, 1987: 01-15. Griffiths, J.G. "Egypt and the Rise of the Synagogue';" in Ancient Synagogues; Historical Analysis and Archaeological Discovery. ed. D. Urman and P.V.M. Flesher, Vol. 1, Leiden, 1995: 3-16. Groh, D.E. "The Stratigraphic Chronology of Galilean Synagogues from the Early Roman Period Through the Early Byzantine Period (ca. 420 CE);" in Ancient Synagogues; Historical Analysis and Archaeological Discovery. ed. D. Urman and P.V.M. Flesher, Vol. 1, Leiden, Brill, 1995: 51-69. Gutman, S. and Yevin, Z. "Excavation in the Synagogue at Horvat Susiya" in Ancient Synagogues Revealed. ed. L.I. Levine, Jerusalem, 1981: 123-128. Gutman, S. , Yeivin, Z. and Netzer, E. "Excavations in the Synagogue at Khirbet Susiya" Qadmoniot: A Journal for the Antiquities of Eretz-Israel and Bible Lands 2, 1972: 47-52, (Hebrew). Gutmann, J. 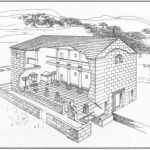 "The Origin of the Synagogue; The Current State of Research" in The Synagogue: Studies in Origins; Archaeology and Architecture. ed. J. Gutmann, New York, 1975: 72-76. Gutmann, J. "Synagogue Origins: Theories and Facts';" in Ancient Synagogues. The State of Research. ed. J. Guttman, Ann Arbor, 1981: 1-6. Gutmann, J. "The Illustrated Midrash in the Dura Synagogue Paintings: A New Dimension for the Study of Judaism" The American Academy for Jewish Research Proceedings L, 1983: 91-104. Gutmann, J. "Sherira Gaon and the Babylonian Origin of the Synagogue';" Occident et Orient; : 209-212.